Product prices and availability are accurate as of 2019-03-17 00:22:59 EDT and are subject to change. Any price and availability information displayed on http://www.amazon.com/ at the time of purchase will apply to the purchase of this product. The Luxe Bidet Neo 120 is a single nozzle, fresh water, non-electric mechanical bidet attachment in the Luxe Bidet Neo Elite Series. Do-It-Yourself Installation The bidet can be installed in 15-20 minutes. The only tools required are a screwdriver and wrench. Instructions and all accessories are included. Adjustable to Fit Most Two-Piece Toilets Adjustable fitting plates allow the bidet to be securely screwed into place between the toilet bowl and seat. 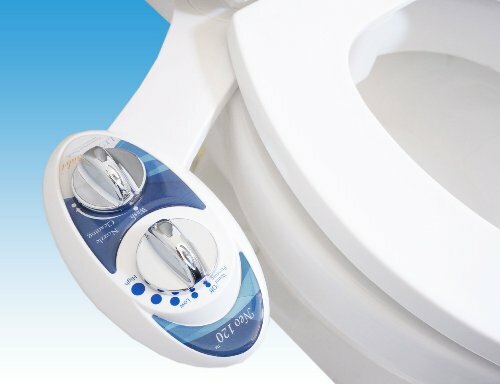 The bidet will attach to most two-piece toilets (where the bowl and tank are separate) and some one-piece toilets. Nozzle Guard Gate The hygienic nozzle guard gate ensures the bidet is always ready for clean operation. The guard gate opens for access to the nozzle. Retractable Nozzle Stays Clean The nozzle only drops below the guard gate when the bidet is used. When the water is turned off, the nozzle automatically retracts for hygienic storage. Convenient Nozzle Cleaning Feature While the bidet is designed to keep the retractable nozzle clean, this model also has a cleaning feature to thoroughly rinse the nozzle. Activate and Adjust Water Pressure Easily The unobtrusive control panel features a polished silver knob that allows the user to activate and adjust water pressure. With clearly defined settings, the bidet can easily be operated by children and the elderly. A second knob switches from wash to nozzle cleaning. Quality Construction and Components Neo bidets, just like quality faucets and showerheads, use high-pressure valves with a metal or ceramic core. Braided steel hoses are included to connect the bidet to the water source. These fittings match standard U.S. plumbing sizes. Additional Details Product comes with an 18 month manufacturer's warranty. Luxe Bidet is a registered trademark of 2Go Products, LLC.